In the second of Samsung's big mobile announcements at CES 2012, the company said it would soon ship the Galaxy Tab 7.7 in conjunction with Verizon. Like the Samsung Galaxy Note, announced earlier today, the Galaxy Tab 7.7 was first introduced last fall at the IFA consumer electronics trade show in Berlin. At the time, we had no news of U.S. availability; and instead got the Galaxy Tab 7.0 Plus as an interim product before the holidays. The Samsung Galaxy Tab 7.7 on Verizon is being billed as the thinnest and lightest of Samsung's tablet line, which of course includes the popular Galaxy Tab 10.1. The Tab 7.7 is the first tablet with a 7.7 inch Super AMOLED Plus display at 1280 by 800 pixel resolutions. The panels went into mass production back in August 2011. Super AMOLED Plus' benefits include high brightness, which may help reading in bright environments, and vibrant colors. In my hands-on, I noticed the Tab 7.7 produced compelling images, but it was hard to gauge how it compares . Text looked sharp, and videos played smoothly and with a sense of dimensionality to the image. Samsung hasn't provided the pixels-per-inch yet, but its 1280 by 800 pixels on a 7.7 inch display won't be the densest pixel count we've see: The already-shipping Toshiba Thrive 7” and the T-Mobile SpringBoard. Both of those models are 7-inch tablets with 1280 by 800 pixel resolution. One thing I noticed immediately about the display is its barely-there air gap. It doesn't appear to be bonded, as with the Barnes & Noble Nook Tablet, but it is noticeably smaller than on the Tab 7.0 Plus or the Galaxy Tab 8.9 or 10.1. That translates into clearer text, and less glare when reading. Inside, the Tab 7.7 has a 1.4GHz dual-core CPU (manufacturer not provided), 1GHz of memory, and 16GB of storage. 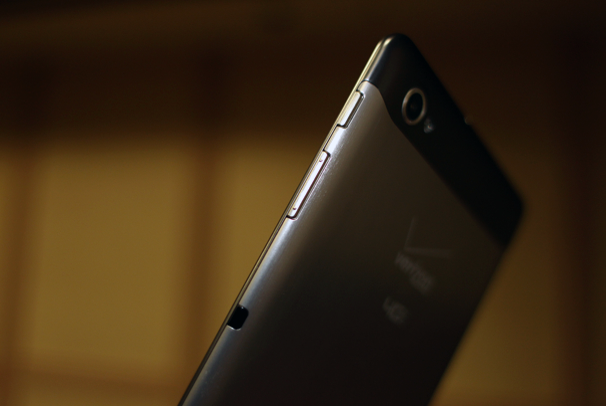 A microSDHC card slot sits along the left vertical side, along with the Verizon LTE SIM card slot. 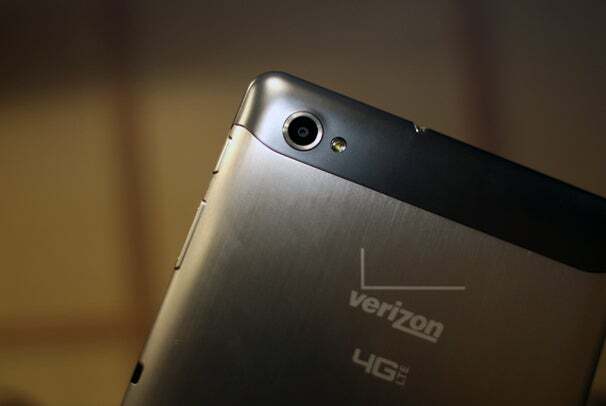 The rear-facing camera is 3-megapixels with flash, front-facing camera is 2 megapixels. Design-wise, the Tab 7.7 is a little more squared off than it's Galaxy Tab 7.0 Plus predecessor, and it has a brushed metal backing and edges. It's also lighter and thinner, measuring just 7.89 millimeters thin (or 0.31 inch). That's practically two-tenths of an inch less than the original 7-inch Galaxy Tab's depth. The Tab 7.7 is also lightweight: 0.75 pounds. I found it felt comfortable to hold one-handed; in use, the tablet barely felt larger than the 7.0 Plus, and in fact, the unit gains most of its extra footprint in its width, not in its length. Like the Galaxy Tab 7.0 Plus, the Tab 7.7 has an IR port along its top horizontal edge. The port works with Peel's Smart Remote software. 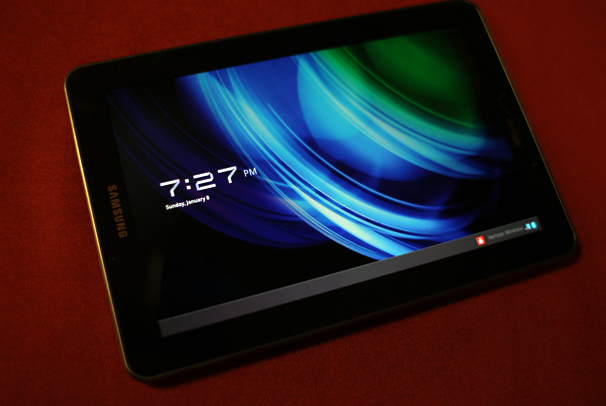 The Tab 7.7 runs Android 3.2, with the same TouchWiz software on-board as on the Tab 8.9 and Tab 7.0 Plus. Interestingly, even though this tablet is clearly aimed at consumers with its IR port and remote control software, Samsung says it will carry the SAFE certification, which means the Tab has a "suite of security features" targeted at enterprise users, such as Mobile Device Management, on-device encryption, and virtual private network support.